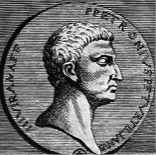 Gaius Petronius Arbiter, to give him his full name, was a 1st century AD Roman poet and novelist. He is well known for being a voluptuary, in other words a pleasure seeker, seeking out carnal adventures by night and often sleeping through the day. He was a royal courtier, part of the Emperor Nero’s inner circle, and it is believed that he wrote the satirical novel Satyricon, although there are doubts about the certainty of this. He was very much in favour at court and was eventually elected to the suffect consul, a powerful position in government. However, Petronius seems to have mostly occupied the position of elegantiae arbiter, giving Nero daily tips on fashion, as opposed to being one his political or military advisers. There is very little reliable evidence of his early life but it is recorded that he was born Titus Petronius Niger during the year 27AD, the whereabouts being unknown. He came from a noble family who would therefore have been quite wealthy. He was presumably well educated as he was known to have written a great deal as well as rising to high office in government circles. His work seems to be a long way from the traditional ancient Roman or Greek style, adopted by so many others at that time. He uses allusions, suggesting that something is a fact but hiding the obvious reference to that being so. It was certainly written for contemporary Roman audiences, whether they be from the proletariat or from patrician circles. It clearly suggests that intimacies between two people can be short and lustful but it is still ok to lie together, before or afterwards, in a loving embrace. It is a typical example of poetry written by a Roman who lived his life in pursuit of pleasure and decadence and accurately reflects the mood of the people, at least those in the “inner circles”, at that time. It is meant to entertain the reader rather than feed their intellectual desire for good literature. Despite seemingly living much of his life as a hedonist, he also served his country well on occasions, taking to public life like the nobleman that he clearly was. His first major appointment was as governor to the Asian province of Bithynia. Later he made consul, otherwise known as First Magistrate of Rome. Petronius lived his life how he chose and, understandably, others with influence were jealous of his position. He was accused of treasonable behaviour by Tigellinus, the commander of the Nero’s imperial guard. The charge that he had been part of a plot to assassinate the Emperor was serious enough to warrant the death sentence, if found guilty, but the accused did not wait to be tried. He took his own life in the traditional way of those times – by opening his veins. This was recorded as something of an “elegant suicide”, an extended process which though it delayed the inevitable, led to his certain death. Gaius Petronius died some time during the year 66AD at the age of 39.